Despite problems with the laying of shore connections and some doubts about the government's intentions for supporting wind generation, offshore activity in the German North and Baltic seas has not slowed down, as these stories illustrate. ABB has won a significant order from the Dutch-German transmission system operator TenneT to supply a power transmission link connecting the AC platform of the Sandbank wind farm in the German North Sea to the HVDC converter station at the SylWin alpha hub. The link will have the capacity to transmit 288 MWe - enough to save 1.5 million tonnes of carbon dioxide emissions per year by replacing fossil fuelled generation. Sandbank is situated in the German Bight area around 90 km from the island of Sylt, where the water depth is between 24m and 35m. The project is fully permitted and is currently in the design phase. Construction is planned to start in 2015, and is expected to finish by 2016. For this project ABB will have turnkey responsibility for the design, engineering, supply and installation of the subsea system including two shunt reactors on the AC platform. The connection will deploy two 3-core 155 kV AC submarine cables, each 36 km long. ABB has already successfully commissioned nine AC cable projects worldwide for offshore wind connections and others are under execution. "Sandbank is the fifth offshore wind connection project in Germany awarded to ABB by TenneT." Sandbank is the fifth offshore wind connection project in Germany awarded to ABB by TenneT. The company is presently executing the AC cable link connecting Energikontor's 111 MW Nordergrunde wind farm off Bremerhaven directly to an onshore substation at Inhausen near Hooksiel. The cable will traverse 28 km subsea and 4 km onshore. Repower has been lined up to supply 18x6.15 MW turbines to the wind farm. The other three projects are offshore wind connections based on HVDC Light technology. BorWin1 has already been commissioned and DolWin1 and DolWin2 are under construction. 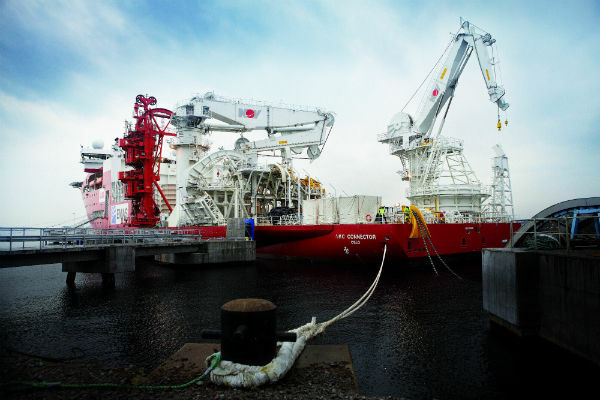 The boom in the subsea connection business, including offshore wind farm connections, powering oil and gas platforms from shore, and underground or subsea interconnectors has benefited ABB which recently announced investments of about $500 million in the US and Sweden to increase its cable production capacity. Siemens has received a new order to supply two German offshore wind power plants. The company will provide 97 wind turbines, each with a rating of 6 MW and a rotor diameter of 154 metres, to the Danish energy provider DONG Energy for its Gode Wind 1 and Gode Wind 2 projects. Gode Wind 1 and 2 (252 MW and 330 MW respectively) will be erected off the North Sea island of Juist, around 45 km from the German coast in water depths of up to 34 m, and will mark the first installation of Siemens' new 6 MW wind turbines in offshore locations in Germany. Siemens will also service the wind turbines for a period of five years. Construction is planned to begin in the first half of 2015, with commissioning scheduled for the second half of 2016. "Offshore wind energy is a vital contributing factor to the success of the energy transition in Germany"
"Offshore wind energy is a vital contributing factor to the success of the energy transition in Germany", commented Markus Tacke, CEO of the Wind Power Division of the Siemens Energy Sector. "Only at sea can wind projects in a performance category equivalent to major power plants be erected in Germany. Offshore wind energy will also act as a stabilisation factor in the German energy mix. Offshore wind power plants produce electricity on more than 340 days in the year, thanks to stable wind conditions at sea." To date, Siemens has installed offshore wind turbines with a total capacity of 3.9 GW at locations around the world and currently has orders for offshore projects with a capacity of around 5 GW on its books. "Despite the fact that offshore wind energy is quite a new technology, we are making great advances. In the coming ten years we intend to reduce costs by up to 40 %" said Mr Tacke. "To accomplish this, it is essential that we have clearly defined and reliable framework conditions for the expansion of offshore wind power in Germany." Siemens has to date installed WTGs for two offshore wind power plants in Germany, with six further projects on the order book and is also supplying WTGs to DONG Energy for the German project Borkum Riffgrund 1. On 19 November Siemens received the Provisional Type Certificate from GL Renewables Certification for its 6 MW offshore WTG. The certificate is a significant step towards final type certification of the wind turbine. It attests the conformity of its design, manufacturing and testing processes for all safety relevant items with the normative references. It is required in many countries around the world and is often a condition of applying for international wind power plant tenders. Siemens developed the SWT-6.0 especially for the demanding conditions in offshore locations. "The certificate is a significant step towards final type certification of the wind turbine"
The first unit was installed in 2011 at the Høvsøre test site in Denmark with a 120 m rotor. The second, with a 154 m rotor, was installed in 2012 at the new national test centre at Østerild, Denmark. In January 2013, Siemens installed two additional SWT- 6.0 prototypes (120 m rotors) at the wind farm at DONG Energy`s demonstration project Gunfleet Sands III in the UK. Siemens installed two additional SWT-6.0 prototypes at DONG Energy`s demonstration wind project Gunfleet Sands III in the UK.